Even as we do more and more on our smartphones and tablets, somehow—inexplicably—paper still piles up. 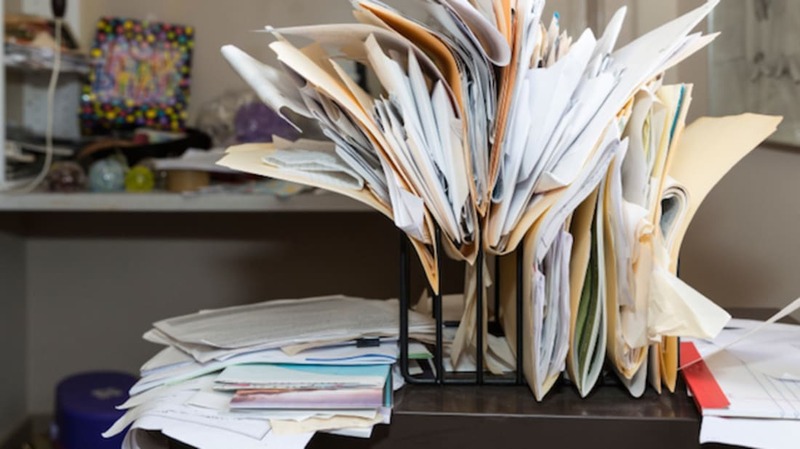 Between receipts, lists, mail, bills, magazines, kids’ homework, photos, and keepsakes, it’s easy to see how a few stray sheets can easily turn into mountains, transforming an otherwise organized place into a messy lair of hoarded correspondence. And trust us: You don’t need to keep that Post-it or all those greeting cards. But we’re not going to extol the virtues of setting up a command center or a family workstation—or anything else that requires much work—here. Just follow these simple tips for banishing paper clutter in real time. 1. SET UP AN INBOX NEAR THE FRONT DOOR. 2. KEEP A WASTEBASKET OR SHREDDER THERE, TOO. One secret to limiting paper clutter? Don’t let anything truly unnecessary get far past the threshold. As you walk inside, and before you drop your mail in its now neatly designated spot, separate junk (catalogs, credit card offers, campaign flyers) from the real deal and recycle/shred accordingly. 3. JUST SAY NO TO CATALOGS. “No one needs to rehearse-shop,” says Mellen. If you’re in the market for something, fine, but don’t flip through catalogs for entertainment—or keep them around for browsing “one day.” To cut down on future mailings, complete one more step before you recycle the booklets: Snap a picture of your address and the return address, and upload it to the app PaperKarma. With a one-month membership ($1.99), the service will remove you from each mailing list for good. 4. WRANGLE YOUR COMPUTER’S DESKTOP. Technically, this is virtual paper clutter—but hey, these documents are still in desperate need of organization. Look at all the files on your desktop and make a quick list of a few categories they could be sorted into, such as projects, family members, or clients. Within the Documents section of your computer, create folders for each, and subfolders as needed. Then clear the desktop and commit to keeping it that way. Using your computer is about to become shockingly more enjoyable (and less panic-inducing). 5. LEARN TO LOVE PINTEREST. That kimchi recipe you tore out of last month’s Bon Appétit? You’re never going to make it. Unless, that is, you opt to go paperless when it comes to kitchen inspo: When you’ve got an idea you want to save, find it online and pin it. Same goes for DIY projects, design ideas, you name it. Or, for an even easier approach, forget about it. If there ever comes a day where you’re dying to make kimchi, you’ll Google it. This one requires a little legwork, but it’s worth it. “As we age, a new generation of digital natives is coming up,” Mellen says. “You might tell yourself that you’ll make a photo album or scrapbook for your grandkids one day, but really—they won’t want it.” Gather photos from anywhere you’ve stashed them (shoe boxes, desk drawers, the fridge door) and scan all your images; apps like PicScanner make short work of the task. Keep only the images you might display or that have true sentimental value, and get rid of the rest. Sure, you adore your daughter’s (or nephew's, or student's) imaginative creations. But nobody expects you to save all of those stick-people portraits just in case your kid’s the next Banksy. Apps like Canvasly and Artkive come in handy here, allowing users to digitize and organize little masterpieces. Keep a few favorites in a file folder for posterity. 8. RECYCLE YOUR MAGAZINES EACH MONTH. 9. SIGN UP FOR ONLINE BILL PAY. This is a list of no brainers, after all. But even folks who do most of their banking online still get notices here and there from their credit card company or financial institutions. On most of those sites, customers can specify that they prefer to receive no snail mail. An easy win for your mail pile. And trees. 10. SNAP PHOTOS OF PAPERS YOU MIGHT NEED. Think you might need to reference that school lunch menu or details on your new polling place later on? No problem. Take a picture of the page on your smartphone and recycle the sheet. Once a month or so, as you’re going through old photos, delete any outdated shots.